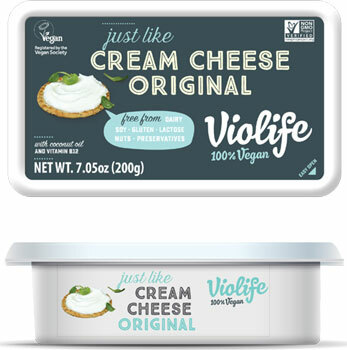 Violife not only makes the BEST vegan hard cheeses, they've also done something truly special with these amazingly rich and creamy spreads that top off bagels like no other. Want to make your own vegan cheesecake? Go for it! 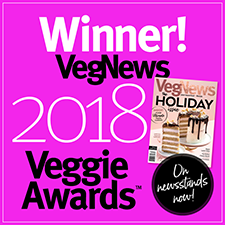 Looking to make plain veggies even tastier? Dip them in! It works perfectly in place for any recipe that calls for dairy-based cream cheese, so spread some on your favorite foods and see just how good Violife can be! Available in 4 delicious varieties, including Original, Gorgonzola, Chili Peppers, and Herbs. 7.05 oz. (200g) tubs are $5.99 each. From Anonymous of Succasunna , New Jersey on 4/10/2019 . Fantastic vegan cream cheese. 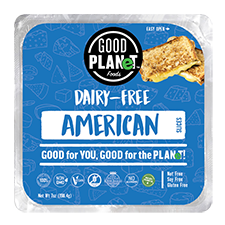 I recently gave up dairy and have not tried other brands but I wanted a vegan cream cheese for my coconut flour pancakes. This one is so close to regular cream cheese that if I didn't know, I probably would never assume it's vegan. From Anonymous of Middlefield, Ohio on 1/16/2019 . Tried the original, gorgonzola, and chili peppers and loved them both! Creamier, tastier, and spreads better than Daiya's. The gorgonzola was my favorite. From brenda king of augusta, Georgia on 12/13/2018 . Thanks Richard from Missouri-I purchased this based on your review. I bought the chili pepper because it was the only one in stock. I will try the original on my next order. I've tried so many cheese spreads that all ended up being a waste of money but this would be a hit even for non-vegans. I plan to bring this along on my next camping trip with friends and not tell them it's vegan. my only complaint is it arrived 3 days before the expiration date, so I sadly had to throw away what was left. The gorgonzola is my favorite! From Kara Z. of Green Bay, Wisconsin on 6/17/2018 . I love the gorgonzola cream cheese. I use it on vegan burgers and buffalo chicken sandwiches. It is also nice on crackers with fruit or jelly. From Anonymous of Alexandria, Virginia on 4/17/2018 . A bit too mild could use more flavor. Almost has a sweetness that is confusing. But with salty crackers not bad. Will definitely try other flavors. Nice option for potluck. From Richard Rankin of La Plata, Missouri on 4/6/2018 . I seem to be the only person buying and reviewing these products. The 'plain' was finally in stock, and it is by far superior to any other vegan brand that I've tried. Go Veggie, Daiya, etc, don't hold a candle to this. This is a home run. From Donna M. of Boulder, Colorado on 4/2/2018 . I bought the Gorgonzola and it knocked my socks off! I haven't had that kind of cheese in many years and the taste of this product was amazingly close to what I remember. Really zingy and flavorful. Wish I'd ordered two! From Richard Rankin of La Plata, Missouri on 3/11/2018 . I tried the herb and chili pepper flavors of this. The chili one, in particular, was excellent. It had a bit of heat and tons of creamy flavor, and reminded me of chile con queso at a really good Mexican restaurant. With tortilla chips, this was heaven. The herb was also really good when I used it in my beans on toast, but I found the herbs a bit too strong just slathered on a bagel by itself. I wish the plain had been in stock when I ordered. I suspect it is fantastic. From Richard Rankin of La Plata, Missouri on 3/5/2018 . When I ordered, only the herb and chile versions were available, so I got both. And, they are amazingly good. Creamy, tasty, flavorful. The pepper one is incredible with tortilla chips and on a veggie burger. The herb one is great with beans on toast, and bagels (and veggie burgers). I'll be ordering these on a regular basis. They put the other cream cheeses (especially Daiya) to shame.